Ye s, I’m a glass half full kind of guy (and the only reason it is half full is because I already enjoyed the first half). Recently I took a “change style indicator” assessment that captures a person’s preferred style in approaching change. The range includes those that are Conservers, Pragmatists and Originators. I was not surprised to find that I was way over on the Originator side, the side that is more comfortable with change. Therefore when I look at 2010 I am excited by the change that is ahead of us. 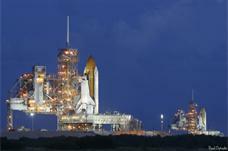 2010 ends one era, with the completion of the Shuttle program, making room for the next generation of space vehicles. Yes, the Space Shuttle is an awesome vehicle. Its capabilities are unmatched and it has served us well over the past 30 years and now it is time to extend our reach. Now that we have our orbiting International laboratory, it is time to leverage it to enable us to reach new destinations like an asteroid, Lagrange points or even to the moons of Mars. But it is not just the possibilities of a “flexible path” to extend humanity’s reach to Mars and beyond that is exciting about this coming year. There are also other changes in the environment that marks us fully entering a new era in Space Exploration. This month we saw Richard Branson unveil his latest vehicle, the “Enterprise”, in the midst of a windstorm in California’s Mojave Desert. The latest Enterprise vehicle is worthy of the name since it will be the first commercial vehicle to take more people closer to space. We also will see this year the launch of the Falcon 9 launch vehicle and get another step closer to commercial cargo access to the International Space Station. Internationally we will see the first module of the Chinese Space Station, Shenzhou-8, being launched and connected in the future to Shenzhou-9. Therefore soon we will have two orbiting laboratories in space and some speculate that this will also be an International Space Station with the partners including Iran, Pakistan and possibly North Korea. Even though this partnership in space could cause some to be concerned, I am reminded of how NASA’s presence in space has created friends out of old enemies. If it could happen before then I believe that space will allow us once again to create new alliances. Pollyanna? I don’t think so. The recent announcement of how NASA is inspiring Muslim students in the STEM (Science Technology Engineering and Math) fields through a collaboration with the Arab Youth Venture Foundation in Abu Dhabi is once again a demonstration of how the agency can bring the world together. In space there are no borders and NASA has continually demonstrated through its exploration programs and inspiration that it exists for the benefit of humanity. So get out your sun glasses because 2010 will be bright with the glow of humanity reaching collectively to the stars. Author sgonzalezPosted on December 22, 2009 March 19, 2013 Tags Commercial Space, Inspiration, International18 Comments on 2010: Gotta Wear Shades! Is it time to start the Federation? Author sgonzalezPosted on June 26, 2009 Tags Commercial Space, International, Space Policy231 Comments on Is it time to start the Federation? During the month when this Shuttle photo was taken, Zhai Zhigang, the Shenzhou VII mission’s commander, was the first taikonaut to take a walk in space. China’s third human mission launched on Thursday, September 25th demonstrates China’s steady efforts to establish a permanent Chinese Human presence in Space. Also in “mid-September, Moscow and Havana negotiated joint space projects. Anatoly Perminov, director of the Federal Space Agency (Roscosmos), said the sides had discussed the possibility of setting up a Cuban space center with Russian assistance.” The interesting part of this editorial was the reference to Arnaldo Tamayo Mendez. I know who is Mr. Mendez? During the time that we were not flying and preparing for the first shuttle mission, Mr. Mendez was the first Cuban to go into space on September 18, 1980. Now 28 years later, we will probably have two additional space agencies within our western hemisphere. Two? Oh, did I forget to mention how our own astronaut, Jose Hernandez is working on a proposal with Mexico to establish Agencia Espacial Mexicana (Mexican Space Agency). Yes, many will not see some of these efforts as ever gaining the momentum to challenge our leadership in space. This may be true, but what should be our strategy forward? There are new alliances and relationships being established in the international community that do not include NASA. Should we leverage these relationships or create new ones? If we were to strengthen our ties with India or initiate a new partnership with the Mexican Space Agency, what would it look like? Let me know what you think. Fifty years later and it is amazing how many still long for another space race. The logic goes something like this, “If we had another Space Race then the public and therefore congress would fully fund American Space Exploration.” As you can imagine there are many strong opinions about the validity of that logic, but at the AAS 2007 national conference titled “Celebrating Fifty Years – But, What’s Next?” I recently heard two opinions that greatly resonated with me. The first was that the initial Space Race must be couched in the context of that time and the global context of today is very different. The second was from the collaborative, social networking culture of Generation Y and their desire to see a global effort to expand our presence in Space. As the speaker shared the Generation Y opinions of the future, what came to mind were the beginnings of “The Federation” for all of you Star Trek fans. But not only is the context different today and the perspectives of the next Generation very different from 50 years ago, the International Space community is much more than just two super powers. In the World Prospects for Government Space Markets Report available from Euroconsult, an in-depth analysis on government civil and military space is captured for the 35 leading countries and organizations, along with insights into the 48 emerging national programs. The first time I saw the below chart I was surprised by some of the emerging programs. Although not shown here, the report also highlights Mexico’s plans to create a Mexican Space Agency, or AEXA, for short. Yes, all of these nations are not involved in the Human Exploration of Space but the number is greater than 2 and growing. Secondly this chart makes the point that space competencies are being found in an ever expanding global community. This growth is being fueled not just by national pride but also by a growing realization that innovation leads to national wealth and attracts more business. For some great insight into this, I would recommend Innovation Nation by John Kao. (More on Innovation in a future blog.) Or for a shorter read, look at the Road map drafted between Russia and the European Union that highlights space as an area of focus for economic growth, Road Map For The Common Economic Space – Building Blocks For Sustained Economic Growth. OK, so what about Space Exploration? I think that JAXA captures it best in their video presentation of their JAXA Vision – JAXA 2025. In the video it shows a moon populated with bases from multiple nations. Currently Russia, (Russia to send manned mission to the Moon by 2025), China (China Plans to Land on Moon By 2024), India, (Indian scientists support human space mission) and Japan are planning human missions to the moon. When those countries arrive they will find other vehicles in the space around the moon and on the lunar surface. Last year “British space scientists said they plan to undertake the country’s first mission to the moon by the end of the decade. Germany also plans an unmanned flight to the moon by 2013. Beside Germany and UK, China, Japan, India and Italy have similar plans.” (see Russia Plans To Go On the Moon). So with all of these countries heading out beyond Low Earth Orbit can you truly call it a race? Or will the better measure of success be who has the greatest staying power? Which nation, once they land on the lunar surface, will establish a lasting presence on the moon? Or better yet, who will partner with whom to reach to the moon and beyond? For me, one of the most interesting aspects of the future of space exploration is the partnerships that are being created for this “New Space Age”. Russia is partnering with ESA to create the Clipper Spacecraft. Russia and India are joining in a moon mission and China is partnering with Nigeria and Venezuela. Earlier this year it was announced that NASA and India have signed an agreement for future cooperation. Yet, more intriguing than the new collaborations is who isn’t included in the team. The original 2 space faring nations are not always included in the teaming arrangements. Adding this to the changing environment in commercial space that I shared last time makes me believe that the next 20 years will be quite different from the past 50. It offers a great deal of opportunity for NASA and a challenge. The opportunity lies in the potential partnerships that we can leverage and the growing expertise that we can tap into globally. 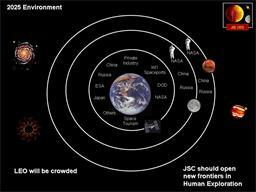 The challenge is to decide if this future environment will necessitate a new or more focused role for JSC and the other NASA centers. Therefore, the question I leave for you this week is whether our role (or if you prefer, the unique value we offer) should change in the future and if so what should it be?